On June 17, 2015, we released the last PlayStation Mobile game. It’s called Oh, Deer! 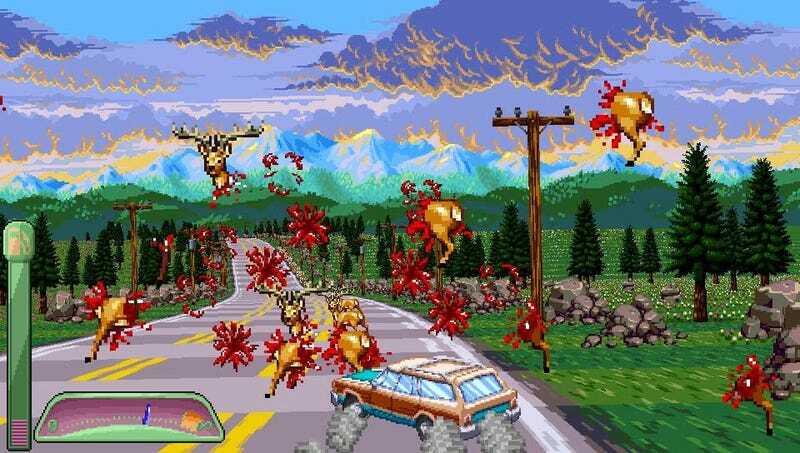 Alpha and it’s an aggressively odd driving game about hitting as many or as few deer with your station wagon as possible on your way to grandma’s house. On Wednesday, PlayStation Mobile is going away forever. You read that correctly. We released a game which would only be purchasable for one month, after which it will be completely gone. Call us crazy (it’s fine, it only makes us stronger! ), but we wanted to give PSM one last hoorah. But why should you care? Maybe you never played a PSM game! Maybe you’ve never even heard of PSM before this very moment. But to us at Necrosoft Games, it matters. It’s the end of an era of open indie publishing on console, with nothing to take its place. PSM was a great idea. It was an accessible marketplace where anyone could release a game on PlayStation hardware (namely the Vita, and earlier in PSM’s life, Xperia smartphones). And at the very beginning of the fledgling platform, Sony took a chance on a few indie developers, giving them a small amount of funding to make small games. We were one of those companies. While we only got a very limited budget – we had less than one programmer’s salary to make an entire game with – it kept us afloat for our first year in business. It’s possible that without that early investment we would not be here. Our first game, Gunhouse (which is still available), didn’t make us any money past that initial funding, but it proved to the world that we exist. It set us on the path to get a deal with Iron Galaxy to make Gunsport. And it’s because Sony took a chance on us, and other developers like us, that we wanted the platform to go out with a bang rather than a whimper. We’ll go down with the ship, and people will know that ship is going down, because it was a good ship. Maybe it had a few leaks, but we loved it. There was so much weird potential with PSM. For our last game on the service, we essentially used it as PlayStation Early Access. People can buy Oh, Deer! Alpha for 49 cents (the cheapest possible price), and then talk with us about the future of its development, and where it might go. Open platforms allow for experimentation in the console space, and I am sad to see that go away. So it may seem insane to release a game for 49 cents—which will make us no money—one month before the platform shutters. (Just two days left!) But we wanted to show the world how important platforms like this are. And we needed to release this for our composer, Motohiro Kawashima, of Streets of Rage 3 fame. Before this, he hadn’t been lead composer on any game since the mid-90s. Now the last time he was a lead composer on a game was June 17, 2015. PlayStation Mobile is like your dear old granddad. Maybe you didn’t see him that often, and you couldn’t always understand him, but you’ll never forget the time he gave you a hundred bucks to buy that 10-speed bike. So thanks PSM; we’ll miss you. You helped to make us who we are today. With that, here’s my personal list of the PSM games you should buy before the platform goes away forever on July 15th. Keep in mind, to get PSM games you have to go into the Vita store (you can’t get them on the web! ), and click the PlayStation Mobile tab, not the games one. Full disclaimer – I’m definitely including our games in this list! Rodem the Wild – unique graphics make this game about being a wild dog extremely charming. 10x8 – a cool PSM-only puzzle game where you can be a muscle princess. Fleet Connection – a Japanese space tactics game with anime undertones. Rymdkapsel – very minimal RTS with annoyingly dumb units, but a very fun premise. Tokyo Jungle Mobile – Tokyo Jungle Tactics!!! Curse of the Crescent Isle DX – Monster Lair style game with a great flare to it. Tuffy – a weirdly obtuse control system which has you moving a corgi through a tower of bones. Yu-Nama the Puzzle – It’s that “Badman” series, in puzzle game form. Ambition of the Slimes – tactics game in which you play as human-controlling slimes. Shuttle Quest 2000 – Game Boy graphics in a shooter/RPG hybrid. Adventure Bar Labyrinth – JRPG with nice pixel art. Brandon Sheffeld is the director of Necrosoft Games. He likes the PC Engine, the Saturn, and 70s Vietnamese rock music. You can follow him on Twitter here and his company Necrosoft Games here.